Following is the rough translation of a page of the same book, same author, same volume. The page is 150. According to him i.e. Imam Ghazali Rh, the corruption of rulers is based upon the weakness and negligence of ulema. Imam Ghazali Rh was unhappy with the ulema of his time for not doing amr bil maroof wan ahi anil munkar. Like the salaf, the ulema of his time stopped stating haq in front of evil rulers. The reason for this was that ulema themselves had developed a lust for dunia and self-praiseworthiness and vanity. “This was the greatness and piety of ulema that while enjoining good and forbidding evil, they wouldn’t care about the grandeur and worldly status of kings and rulers. They had had tawakul in Allah’s blessings and mercy. And they were confident that Allah will protect them. And they were also content on the fact that if Allah has degreed martyrdom for them then so be it. This is because they had sincerity of intention. Because of their ikhlas, their naseeha had a profound effect on the other person. However, nowadays because of fear of losing dunia, the ulema are silent and if they open their mouth then their words and actions don’t match and because of this no one heeds to their advice. If today also, they become truthful and do their duty with honesty then they would definitely succeed. Muslims are in dire need of khilafah from the last 90 or so years. It is such an important institution that when a dispute began among the ansar and muhajireen that who is to be the ruler of muslimeen. Umar RA asked Abu Bakr RA to come to settle down this matter (before it becomes uncontrollable) who was at that time busy in preparing Prophet Muhammad's SAWS body for burial. So this incident shows that khilafah is of that much importance for the supremacy and existence of Islam that the Sahaba RA had to leave the burial process of Prophet Muhammad SAWS to his close family members and attend the majlis of Sahaba RA where this debate about the next ruler was taking place. Ulema and Mashaykh have the utmost responsibility of gathering a strong jamaat and establish khilafah through jihad. If they are unable to do so then at least they must give dawah to establish khilafah. Common Muslims have the duty to correct themselves, learn the basics of deen and give dawah to others but on the same time they mustn't forget that the only purpose they are doing all this is to establish shariah one day which will spread throughout the world. Islam will establish as a deen in the whole world and no other way of life will remain. This has been prophesied in the ahadith and this is not impossible to accomplish. This is difficult and demands the utmost sacrifice but is not impossible. Otherwise the ahadith would not indicate it that this will happen if it would have been impossible. If Muslims forget that their purpose is to bring khilafah back and spread it throughout the world then they will lose the spirit of deen and Islam will merely become just a religion of some customs and traditions like other religions and will face the same fate as Christianity and Judaism have met. It didn't Impress me, I continue to appreciate effort by tablighis and madaris. And your dream, impossible and impractical, non achievable goal. But don't give up. Best of luck. It is not a dream. It is a reality mentioned in ahadith of Rasoolullah saws. May Allah give you and us all hope and courage. I didn't deny the importance of institutions you mentioned. However they aren't enough. 150 years have passed and the ummah is still weak and troubled despite of numerous efforts and several thousand workers of Deen. Khilafah is the only solution and yes t is possible. 150 years have passed and the ummah is still weak and troubled despite of numerous efforts and several thousand workers of Deen. To know how Ummah got benefited by Tabligh and Madaris, you have to go 50 years back, sit and hear from your grandpas, whichever country you may be living in. visit countries and places where the migrants didn't carry Tabligh and Madaris with them and witness it yourselves. There is a country where 1.8 million Arabs have moved as migrants, from Phalestine, Lebanon etc, it is on official records. You can't find them now. Mass Irtedad. There are many such countries in present world. Tabligh and madaris are appreciated by people who believe in realistic and achievable goals. Even 10% change is big change for them. But Alhamdulillah tabligh and madaris have brought big change in ummah. Ummah is witness to that and appreciates it. For last 60 years people who believe in "khilafath is the only solution" have not moved an inch. When they get old and weak they say "we intent to establish khilafath, we are not accountable and we will be suitably rewarded". And the way things stand this "making intention" only will continue for another 100 years. No Sir! I beg to disagree with you. When I say that the ummah is still in trouble and weak. By that I don't mean that we don't have enough namazis, saumis and hajis. What I mean is that we are still dis united after 150 years of work, we don't have any standing in the world. When a US citizen kills our people, he is freed by our government under pressure, and when they want to capture a muslimah from our lands , our secular authorities happily collaborate and handover her to them. You call it success but I don't think so. When there was khilafah (or a single Islamic monarchy), we conquered the lands of the kuffar to save one muslimah and introduced Islam to that region. However, now we are too weak that our authorities hand over our citizens on the demand of kuffar. The kuffar have no problem with our saums and salahs. There are many masajid in the kuffar's land. And none of them have been destroyed. None of them apart from Communists (in the past) have stopped anyone from offering prayers. I repeat that I am not undermining the efforts you mentioned. I appreciate, adore, support and respect them. However, I don't believe them to be an end in itself. These institutions are just means to an end. And the end goal is khilafah which is the only solution to liberate the majority from the tyranny of secular and satanic system and lead them to Tauheed and Prophetic ways. I also disagree that those who want to establish khilafah have failed. Yes there are hurdles in their path. And their progress has slowed down. However, the greater goal you have, the greater sacrifice it needs, and the greater hurdles you will have to face. At the beginning of this century a miracle has happened and 60 technologically advanced thugs with their super ego, couldn't humble poor ill equipped group of Muslims. These thugs have lost their prestige and all they have left is empty slogans and artificial makeup of fake superiority. The tide has been turned. Khilafah is coming soon Insha Allah. If you are analyzing things based on number then according to a wikipedia article in 2008, it was an estimate that all around the world there are 12 to 20 million members of tabligh around the world. If there are around 2 billion muslims all over the world then it means that only 2 people out of 200 have been affected by this blessed work and this work was started 90 years ago. And now cracks are being found unfortunately in this work. Both of us respect and appreciate tabligh, khanqah and madrassah. However, you think that these efforts are enough but I don't think so. This is the only difference. I pray to Al Mighty that He may give us courage and hope. You think that this misery and "supposed failure" will continue 100 more years. If I am alive after 20 or so years, I am ready to bet here on this forum that this will not be the case. The night is almost over. Yes there is a hurricane but the dawn is near. I am witnessing something great in Khorasan. Call me insane, mad, stupid or idealist. Call me anything you want. Every senior alim, every major alim from different schools of thoughts is accepting that this is the age of Dajjal. His arrival is very near. My question to those who deny the possibility of khilafah. If Sayyidina Isa As is a reality then is Imam Mahdi not a reality? If Armagaddon is a reality then is Malhamatul Qubra not a reality? If the final war is a reality then is victory after trial of Muslims not a reality? If all the above statements are correct then is Global Khilafah not a reality? 1. 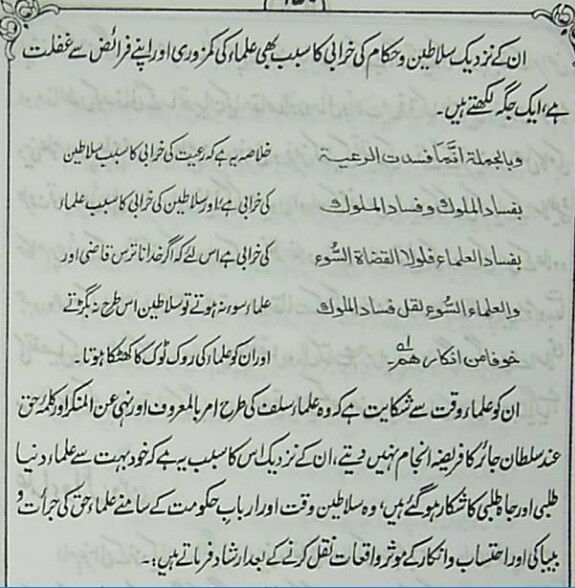 First page of Fadhail e Tabligh where Shaykh Zakariya RH is explaining a verse of Quran. 2. 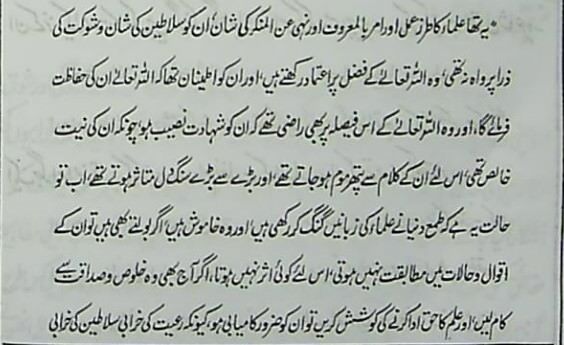 The whole chapter "Musalmanon ki pasti ka wahid ilaaj"
You say "When I say that the ummah is still in trouble and weak." And dreams are not solution for the trouble. In my place they say "You starve for a week, we promise you briyani after a week"
You read history, when masses distanced themselves from deen, they collapsed under khilafath. So let us continue with our efforts of reforming ummah. Prevailing worst conditions, we are happy with status quo. "Wala tamutunna illa wa antum muslimeen" is our goal. We should be careful for calling something a dream when that thing is clearly mentioned in the ahadith. Khilafah only prevailed for 30 or so years under the leadership of five caliphs namely Sayyidina Abu Bakr RA, Umar RA, Uthman RA, Ali RA and Umar bin Abdul Aziz RH. In these times, the masses were on the deen and not away from the deen. As far as other times are concerned, there was no true khilafah but monarchy. There are at least three instances in history where we witness that it was the sword which united the ummah under one flag. 1. The first major irtidad in this ummah was in the period of Caliph Abu Bakr RA when immediately after the demise of Prophet Muhammad SAWS, the Arab peninsula revolted. My question, did he send dawah jamaats to bring the murtadadeen back to Islam or did he fight with them till they submitted and repented? 2. When the Abbasid monarchy was very weak, and Andalusia was divided, it was the sword of Yusuf bin Tashfin RH who first united Africa and then Andalusia with his sword, implemented shariah rule and defeated the Christians. 3. Salahuddin Ayubi Rh united the divided kingdoms of Fatimids and Abassids into one single kingdom and fought and defeated the crusaders with his sword. All of these great heroes of Islam were the product of dawah, ilm and tazkiyah but all of them used sword to unite and end the fitnah. Every institution of the deen has it's own place whether it is individual effort or collective effort. Whether it is tabligh, ilm, tazkiya or qitaal. Whether it is reformation at local and grass roots level or at collective level. Whether it is work of deen by a jamaat or work of deen by a state run by the principles of Quran and Sunnah. Every institution is important and has it's own place. I will Insha Allah firmly keep on believing till my death that Islam is not only merely a religion but it is a way of life which guides us in every aspect of individual and collective life. The major tragedy today is anyone with new ideas, wants to poach on brothers who are already busy with offering sacrifices in some effort. They constitute less than 1 percent of ummah. Why can't these brothers with powerful ideas and have very great dreams and who offer one solution for all the problems of ummah; meet and convince the remaining 99% muslims and create their resources. No!!! is the reply, we want spoon feeding. Or a kind of black marketing. "You do your job, we will do our job and we are happy with that" is the message from us. Lol! It's a tragedy that when one gives evidence for one's views then those views become "new" to brothers who can't respond to the evidence and keep on calling an idea "which they are unfortunately not exposed to" as alien and new. Reminds me of a hadith which says that Islam will become ghareeb one day. It's also strange that despite of this being said repeatedly that these efforts are appreciated and respected but these aren't enough for so and so reason but still those brothers become defensive and feel that their effort is being insulted. If we call ourselves deobandis or follow it's manhaj and maslak then we also should read the lives of our akabir. Why they founded darul uloom deoband? What was their purpose? No one is denying the importance of any institution of deen. Be calm and cool. If you disagree then it's fine with me. I love you and I support your effort and respect your beliefs. And I attended today's mashwara after fajr and I try my best to participate in this effort as much as I can despite of my differences. So just chill. I apologize if I have hurt your feelings. It was not my intention. And if your intention in sitting mashwarah is to poach on sathees, please avoid it. Sit in mashwarah with sole intention of participating in the effort. I just wanted to add one thing to those who say Khilafat won't happen or is impossible - It will inshaAllah and we live in times where we even saw a glimpse of it! Hamein eis se bahas naheen hai ke zameen per kiski hukumath hai, eh dekhein ke diloen per kiski hukumath hai. Whatever happens in one place is not the universal solution. Wallah!! Brother you have not hurt me.